If you're applying for your first driver's license in North Dakota, the Department of Transportation will first issue you an instruction permit so you can practice driving. Your instruction permit will allow you to drive only while supervised and help you to prepare for your road test. 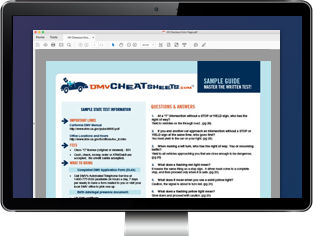 This page gives you information on how to apply for your instruction permit and what other steps you need to take to obtain your full driver's license. If you've recently moved to North Dakota, you must transfer your out-of-state driver's license within 60 days. If you have an out-of-state permit (or equivalent), contact the North Dakota DOT directly to check if you can transfer it for a ND instruction permit. Have your parent/guardian's approval, if you're younger than 18 years old. Your parent/guardian must sign the form. NOTE: A list of accepted documents can be found in the Noncommercial Driver's License Manual. 1 hour before the office closes for lunch. 1 hour prior to closing for the day. There is a $5 fee for the written test. The exam will test your knowledge of North Dakota traffic signs and road rules. You should study the ND Noncommercial Driver's License Manual to make sure you're fully prepared. Not sure if you're ready for the written permit test? Try an online practice test today! A North Dakota driver's permit enables you to legally practice driving ONLY while accompanied by a licensed driver who is 18 years old or older and has had at least 3 years of driving experience. Your supervising driver must be seated next to you in the front seat and no other passenger may occupy that seat. A driver’s education course, which includes behind-the-wheel instruction. 50 hours of supervised driving practice. When you apply for your driver's license, your parent must verify in writing that you completed these hours. The step after obtaining your learner's permit is to apply for your driver's license. 14 years old to 15 years old: 1 year, or until you turn 16 years old (whichever comes first). Must be held for at least 6 months. Under 18 years old: 6 months, or until you turn 18 years old (whichever comes first). 50 hours of supervised driving practice (see “Behind-the-Wheel Requirements" above). If you're under 16 years old, you will be issued a restricted driver's license. Once you turn 16 years old, your restrictions will be lifted. For more information about applying for your driver's license, see our Applying for a New License (Teen Drivers) in North Dakota page.